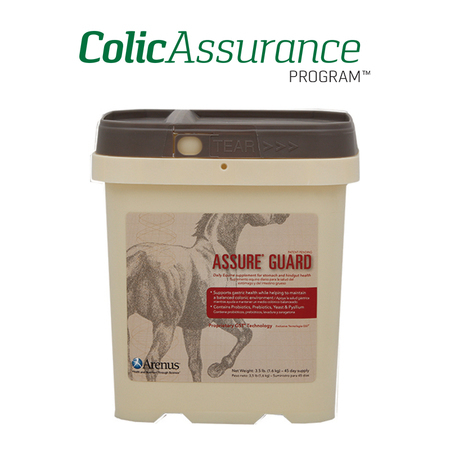 Assure (daily digestive aid): Feed one level scoop (17.4 grams) daily. Assure Plus (sand removal formula): Feed two heaping scoops (8oz) 1x daily for five days straight, one time per month. Continue feeding Assure granules while feeding Assure Plus. Assure Plus (sand removal formula): Feed one (4oz) scoop one time daily for two days, feed two heaping scoops (8oz) 1x daily for five weeks straight. Continue feeding Assure granules while feeding Assure Plus. Banamine: Give a 500# dose 1x daily on day 2 and day 3 after starting treatment. On each day of treatment, place two cups of manure into a bag with water and mix together. By day three, it is likely that sand will be visible in the bag. Monitor for colic and/or cramping. Assure and Assure Plus are available through Arenus, 1-866-791-3344. Please provide them our clinic name when ordering. Banamine may be purchased through our clinic. Be sure to mention A. Cary Hills, DVM is Professional partner # PRP-63892 and receive 5% off your order.